Any transition in work life can be very stressful. The information and activities provided in the Job Seekers Guide can help you through this stressful transition. The purpose of the Job Seekers Guide is to provide you with a step-by-step process that can be started at any time in your transition. Managing your career is a process, and it can be different for each person. For the purpose of this guide to work for everybody this site has been separated into five sections that reflect each step in the Manage Your Career wheel. Below are brief descriptions of each step that can help you determine which step to begin with. How do you know where to go if you don’t know where you are? This step helps you discover and organize all of your skills, interests, and values that are necessary to explore the world of work and present yourself to a potential employer. It is a good idea to do this step every year, even if you have a job, since you may have gained new skills, or your interests and values may have changed. Can you name all 900 occupations that exist in the world of work? Neither can we. In this step you will learn how to take all the information you learned about yourself in Step 1 and explore occupations that fit the person you are today, without reading through all 900 occupational descriptions. You will learn how to research the educational requirements, tasks, outlook and growth, average salaries, and skills necessary for occupations that interest you. So, you want to be an underwater welder do you? Now that you have narrowed down the direction you want to go in, setting goals and making a plan will improve your chances of getting there. Do I need to know how to swim to get scuba certified? Yes. In this step you will list the skills you need to learn and where to get them before you start the job search. Don’t forget that we are always here to help you in your process. Self- assessment tools are a great way to get started. However, if you are interested in a more in-depth process consider meeting with a professional career counselor. You may find a career counselor at your college or university, at JVS Detroit or by searching for career counseling offices on line. You can also view and download the complete JVS Detroit Job Seekers Guide (pdf). 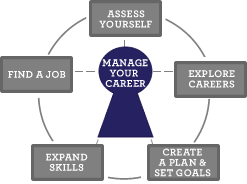 Why you should manage your career. Getting more help using resources at JVS Detroit.